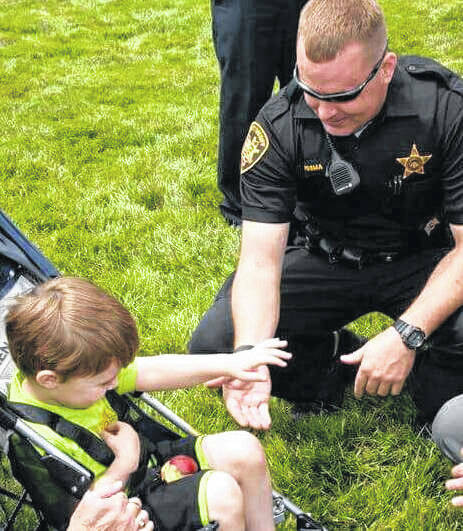 Deputy David Posma interacting with underprivileged child. DAYTON — David Posma, A 2003 graduate of Butler High School, has been named the 2018 Outstanding Police Officer of the Community/OPOC award winner. Police softball sponsor Vaughan Garrett poured over several well deserving nominees and eventually selected David due to his impressive body of work and contributions in Montgomery County Ohio. David is a Montgomery County Sheriff Deputy and SWAT officer. David is a member of the KY Blue softball team, was previously with OH50, and has attended the Las Vegas PS World Series the past 7 years. David worked as one of two community officers for the past 2 1/2 years, as well as road patrol. He worked in a community of 500 low income apts. and interacted with the children living there on a daily basis. He also works with the kids through school programs rewarding students for good grades & good behavior. David would accompany them on field trips or celebrating by having a picnic on school grounds. He never misses an opportunity when there is a community event to meet with the adults & kids, and works to give them a positive experience with the police, that they’re the “Good Guys”. As a community resource officer David became a well loved mentor, and trusted friend. The kids look up to him, and he is such a good example for them. He has helped tremendously to bridge the gap between the police & the community. Throughout the year, David helps out in many ways with the members of the community, both adults and the kids. Helping changing a tire or just spending some time listening…..or passing a football. At Christmas time, he noticed that quite a few of the children didn’t get any gifts at all because their parents couldn’t afford them. The first year, he took it upon himself to give a six year old his first ever Christmas tree & a present he had wanted “more than anything!”. He made a difference in this young man’s life that will stay with him forever! This year, he decided to host a Christmas Party for all the children in the complex who wanted to come. It started out small, but ended up with 130 children signed up! He arranged with “Toys for Tots”, and the Sheriff’s “Police Athletic League” to provide presents for all the kids, and he & his partner wrapped over 190 gifts themselves over a couple weeks! The party also had Santa there, snacks & drinks, and he got the fire dept. involved & they gave each family a ham for Christmas dinner. Even the local news heard about it and did a story on it. He also coordinated adopting a family in the township and gave them a wonderful Christmas as well. David does everything for the community he works in without wanting or seeking any recognition, but it would be wonderful for him to finally be recognized for all the valuable work he does, going above & beyond and making an impact on so many impressionable young lives.